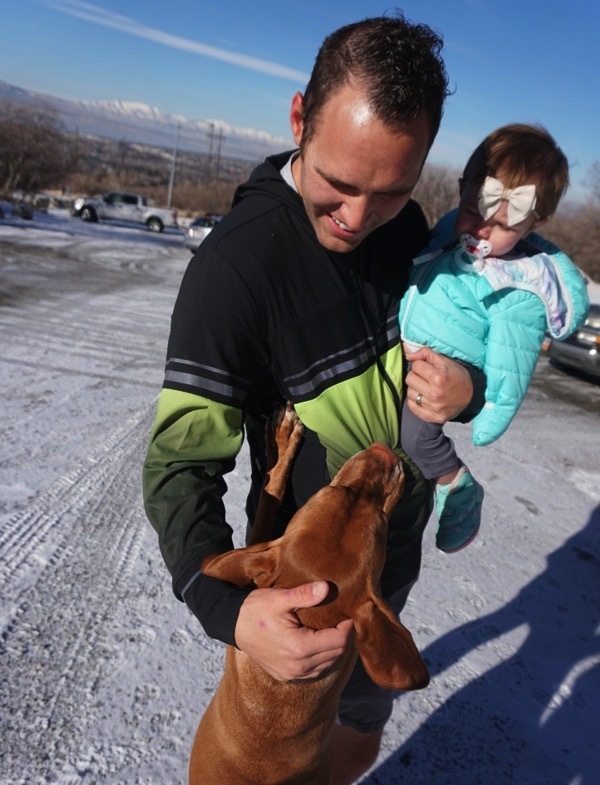 Andrew wanted to take this dog in the picture below home to give Beretta a fur sister. Skye studies dogs quite thoroughly each time she sees a new one. Beretta is pretty slow moving when she is at home so Skye finds it extra interesting to see a super hyper bouncing dog. I pulled the opposite extreme yesterday and I woke up last second and went running way later on in the day during Skye’s nap. Andrew had a rest day and I went out for 7 miles @ an 8:48 average pace. Andrew is following the same plan that I am but he is taking more rest days than I am as we get his body used to higher mileage. We both need to get to this starting line injury free even if it means we are a little undertrained. It’s slick here on the roads and sidewalks so I wore my new Cascadias for more grip. Aren’t these shoes beautiful and don’t my ankles look freezing?! Also, I bought Yaktrax but they feel so strange to me… maybe I just need to get used to them?! I listened to Oprah’s Supersoul with Gabrielle Union and Dwyane Wade during the run and really loved it… Just another day where I wonder how I ever lived without podcasts, they are so entertaining and inspiring for me. But at night our church group had a big Christmas dinner. 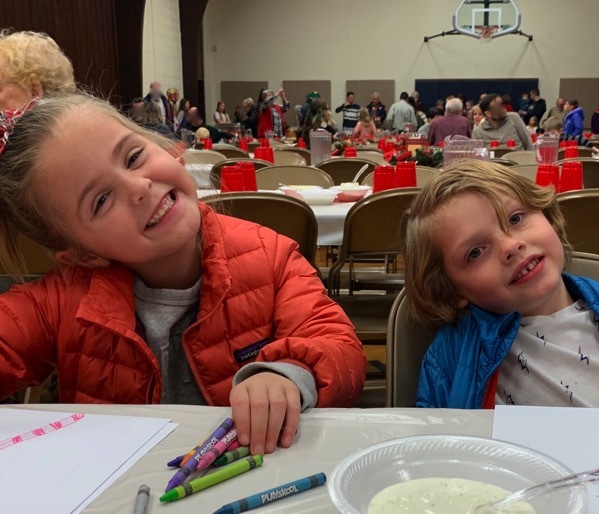 It started thirty minutes before Skye’s bedtime so she really enjoyed the experience;) Brooke and Knox have already made some really close friends at church and I’m very grateful for that. They sat with us for about 15 minutes and then they were off with their friends… and so it begins. 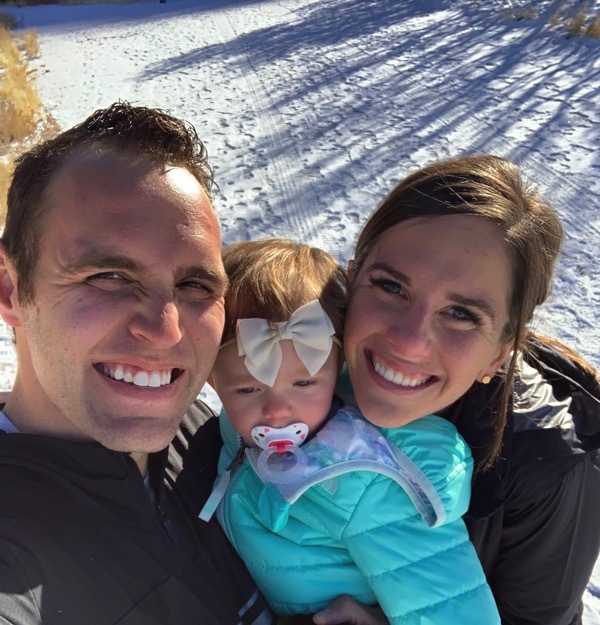 I have a few more gift ideas to share for the runner in your life followed by a few favorite things! *And this mug. It’s a really good question if you think about it. Running is addicted to US. 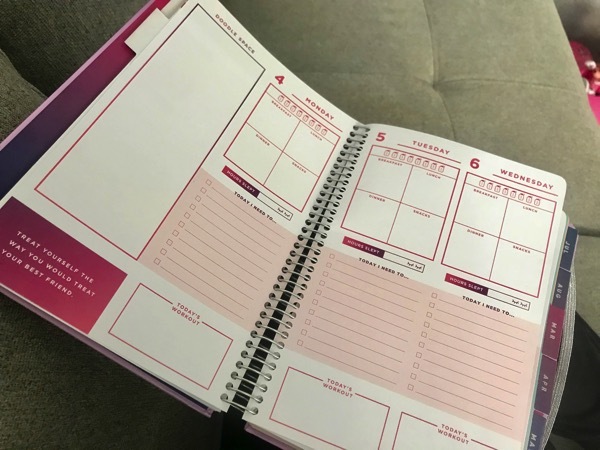 *This is an awesome fitness planner that includes things like motivational quotes, water/sleep/habit trackers and meal planning space. 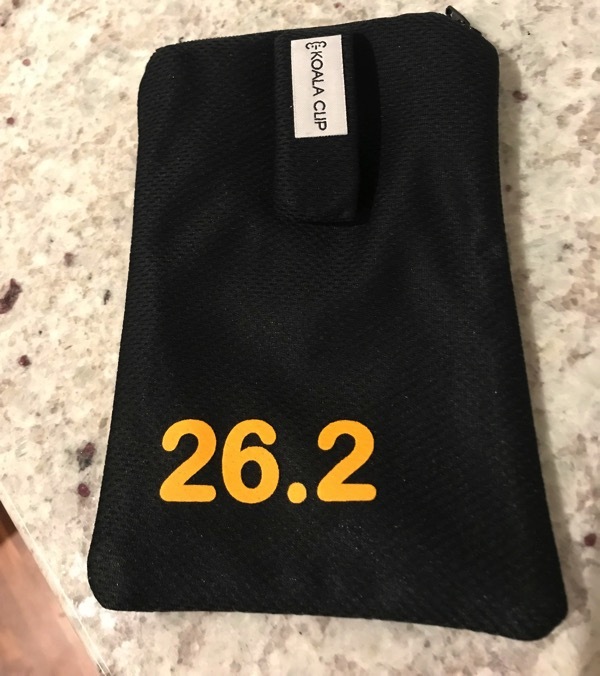 *The Koala Clip is such a great gift/stocking stuffer for the runners in your life. I cannot run without mine and I love that you don’t even feel your phone while you are running. Use the code HRG10 to get 10% off! *The Run Angel (you can find my entire review here). I think it is a great idea to give your people this gift of helping them to run safer (and the best gift to give yourself too). *Our bed is all done! I wanted to share on here the sheets that we got because they feel so so good. They are linen and we are both obsessed. They are here. 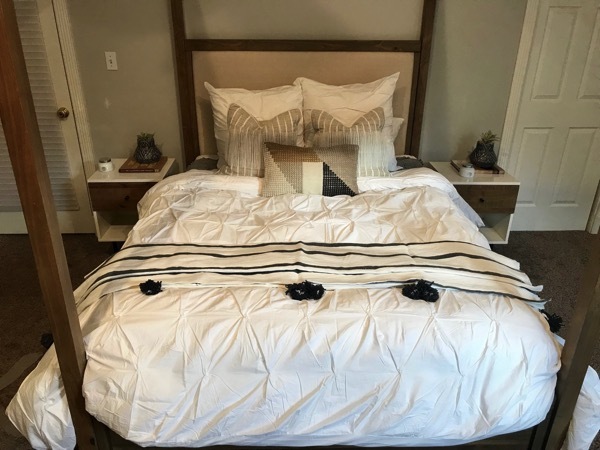 We also got our duvet cover from West Elm (on a day that bedding was 40% wahoo) and our pillows are from Four Chairs Furniture. 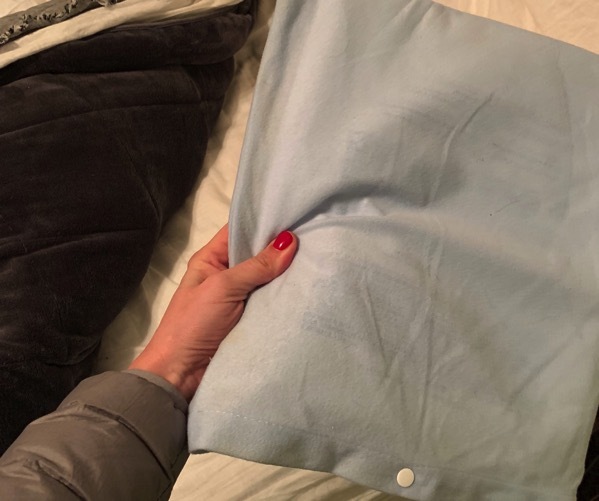 *I started putting a heating pad (I want this one… it looks so much softer) in my bed as I am getting ready for bed each night so that when I get under the covers it is nice and toasty. Andrew laughs at my bedtime routine that takes 30 minutes. I just enjoy the whole process of getting everything ready for me to hibernate for 8 hours. 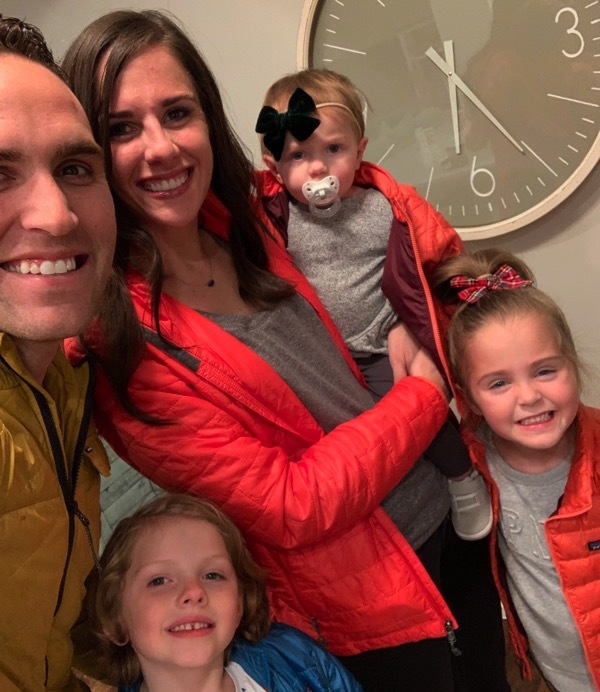 *Andrew and I both liked the new Grinch movie in the theaters better than the Jim Carey Grinch and Brooke loved it too. 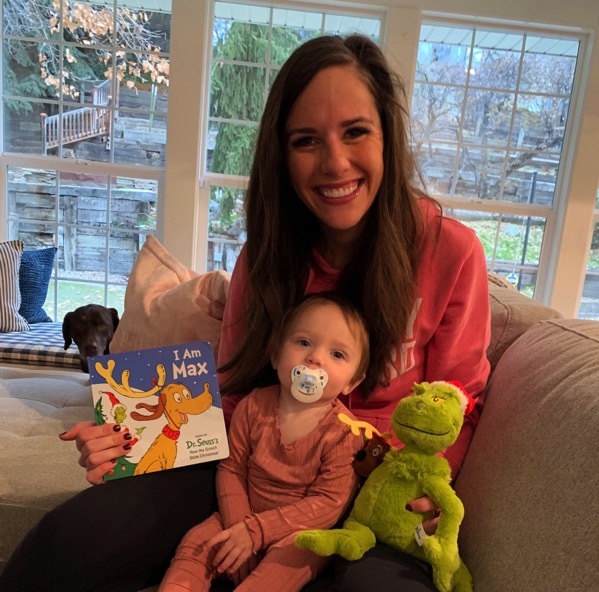 Also, my sister-in-law gave Skye this cute book and the grinch to her for her bday. *I got this one from my mom—> As soon as I start to feel like I am getting sick I take this and it shortens the sickness big time and it never really gets bad at all.. 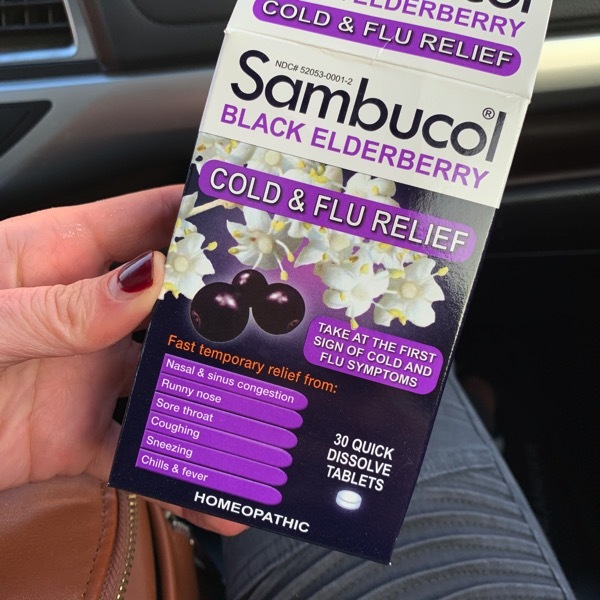 I started to feel a sore throat and cold coming on last week and Sambucol saved me. *Skye’s pjs. I am ordering these same pjs for Brooke (and I would for myself if I could find my size… they are so soft). PS Beretta is just watching to see if Skye is going to drop any food for her. 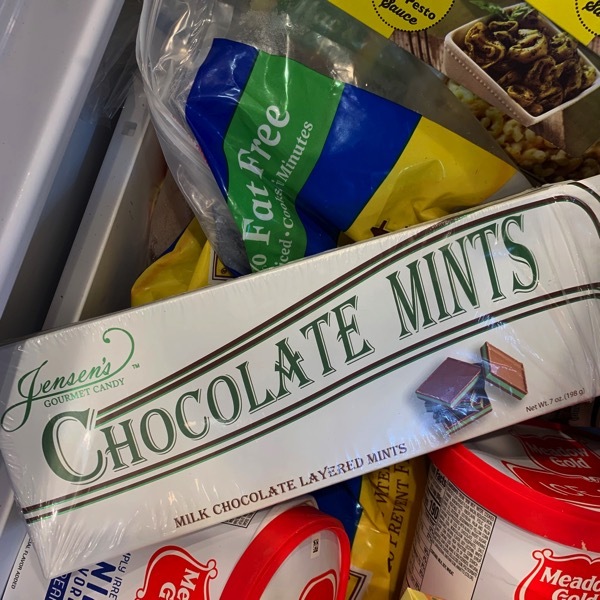 *Frozen chocolate mints (Andes are the best in my opinion). They just taste so fresh and delicious when frozen. Also, this picture explains to me why freezer burn ice cream is a very common occurrence for us. To enter: Leave a comment below telling me anything you would like! I’ll choose two winners through random.org on Monday. You can also get 15% off a Run Angel with the code HRG15 HERE! 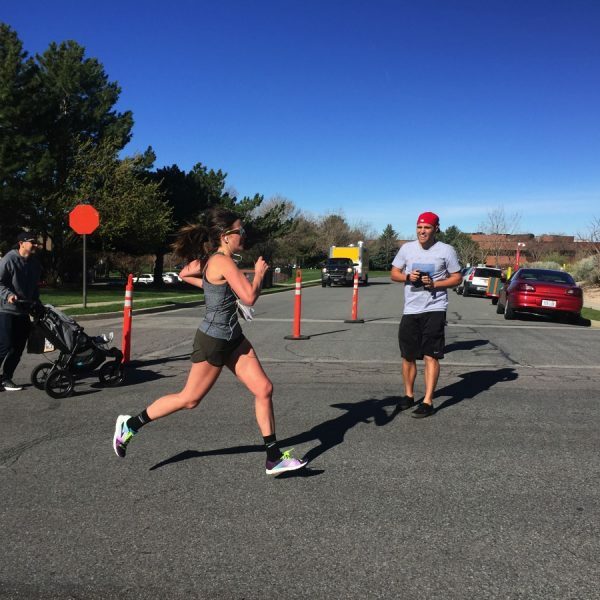 Emigration Canyon 1/2 Marathon Recap + MY RACE PLAYLIST!!! Just one of those runs. Friday…finally! I’m with you on Andes mints. Chocolate and mint together make me smile! YOU WON!!! EMAIL ME ASAP LISA!!!! I am moving to a new country! I need a run angel as I start to explore! I just started exercising again (personal problems took over which I should have never let happen). I have over 100 pounds to lose and am slowly starting to exercise when I get home at night. I would love a run angel to help keep me safe on my fitness journey. Happy holidays. I’ve had the Run Angel in my cart for several months now, but I’ve yet to hit the order button! 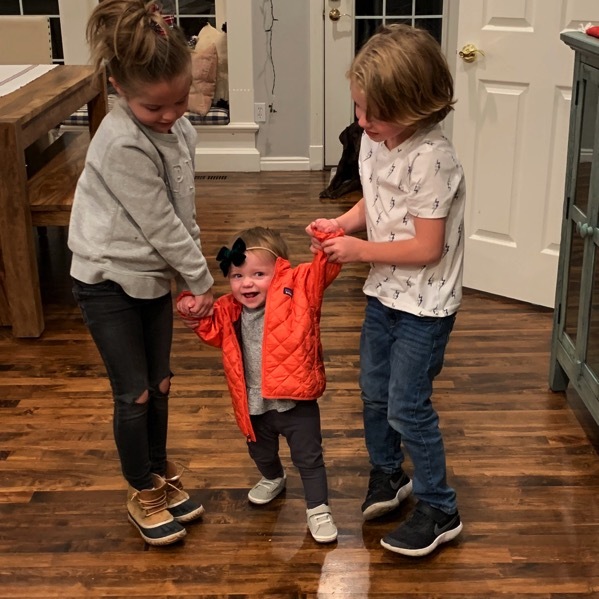 Your family is absolutely adorable, and I love reading your blog. Merry Christmas and Happy Ultra Training!!! I would love a run angel to keep me safe on my journey to fitness. I’ve been wanting a RunAngel for a while! 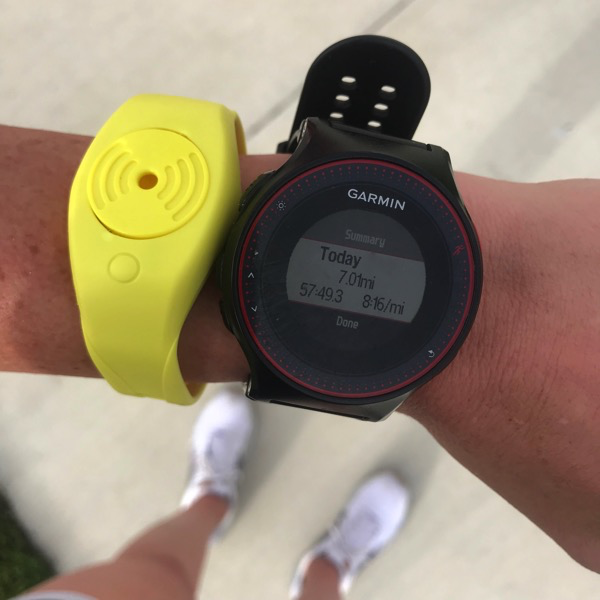 I live in the city and run on my own a lot; it’d make my dad so happy if I had some kind of safety device on when I do my long runs! Andes Mints on top of a brownie mix (gheradelli) is heaven! The run angel would be so nice to have for my runs, especially when I go running with my son on the trails. Would love a Run Angel! Also, you are brave to take Skye out so close to bedtime!! I am training for my first half in May and I am hoping for a Run Angel to feel safe on my long runs :) Thanks Janae!!!!!!!! Happy Friday! Have a great weekend! I’m a new listener of Ali on the Run podcast @aliontherun1 and I listened to your 2 episodes last week! The episodes just flew by and it sounded like 2 girlfriends chatting while recording… I mean it was, but so refreshing to hear two people talk who just like each other and are so supportive of each other :) You really should run the NY Half or Full Marathon sometime so we, readers and listeners, can just be happy y’all are hanging out together ~ ha. Have a great weekend Janae!! You and Andrew rock out your long runs!! We fly home from Hawaii on Sunday. Which means a long run tomorrow, followed by a trip to the North Shore, and packing! Love your blog! I would love a run angel! I run a lot on a local trail that can be secluded… thanks for all the work you put into your blog! I would love a Run Angel so I can feel a bit more safe during my runs alone! I look forward to reading your blog every single morning! It has become part of my routine. You are such an inspiration and breath of fresh air! I would love to win a Run Angel! I remember thinking how cool it was when you first talked about it on your blog. It would make me feel so much safer! And, I agree, frozen mints are the best. I also love putting Keebler Grasshopper cookies in the freezer! They taste so much better that way. 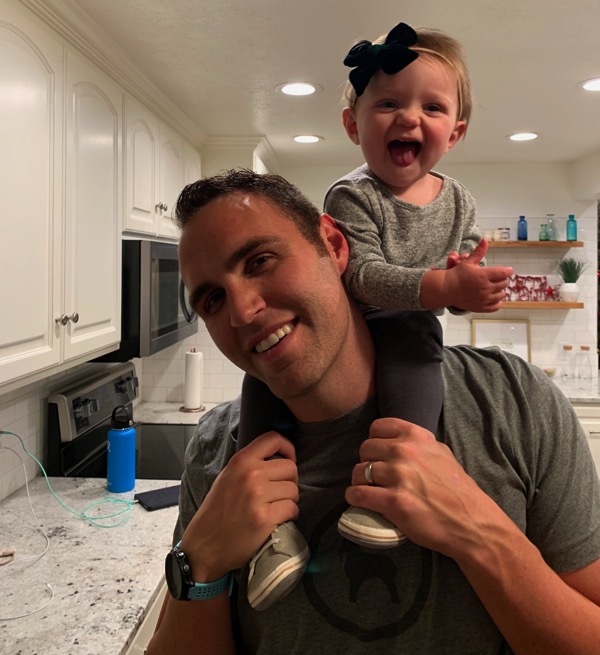 I would love a Run Angel to help ensure both mine and my daughter’s safety while running! I love to hear about your progress with this new trail running adventure plan!! I took a half day from work today so I was actually able to be off work when it’s daylight out, and it’s not horrible weather here today so I got in a 3 mile run! Feels like nothing compared to what I was doing, but a month since my race and I was still able to run my normal pace without any issues. I’ll take that as a win! Plus it shows that all the strength training and HIIT work does keep my fitness up! I would love a run angel. I do a lot of solo runs (often in the early morning) so it would be a nice extra layer of safety for me! How much snow did you have when you were wearing your YakTrax? I find that unless there’s enough snow that the coils never break through to pavement/concrete, the YakTrax feel weird…kind of hard and uneven. Because of that, unless there’s 6″ish of snow or more, I don’t wear mine on the paths/sidewalks/roads. But, good news…they are FANTASTIC on snowy, icy trails because there’s enough “give” in the trail that they don’t feel weird even if you break through the snow. And in deep snow, I’ve done up to 6 miles on sidewalk/path with them and they felt okay. I keep looking at the run angel. I should have asked for it for Christmas! Would love to win one, I’m out on the trails by myself all the time. I have an electric underpaid for my bed and it is the best! I crank it up when I brush my teeth and my side is toasty by the time I get in! Ok, it’s the best until I forget to turn it off and wake up sweaty. I do 99% of my runs in the dark, so I would love a run angel! Merry Christmas to you all! Happy Friday!!!!! I would love to win something like this. Andes mints on top of the plain costco cheesecake is pretty awesome. I’ll be bringing that to Christmas. I would love to win a run angel! Both my running partners are hurt and I’m doing my run solo and in the dark after work. It would be a great for extra security! I’m so glad you mentioned the Run Angel, I remember when you first posted about it I wanted to put it on my Christmas list! And I agree the YakTrax are a little weird. Sometimes they are just necessary when it’s icy, but it doesn’t really feel like natural running to me. I’ve had better luck putting studs in my shoes (I use the same ones my husband uses on his fat bike tires). Those don’t seem to be as noticeable, and are way better if you hit dry patches of pavement. And I do the same with the heating pad before bed, it’s the best! I run alone and would love to have this. I do carry mace and stay very alert but you can never be too careful! I would love a Run Angel, especially since I often run alone! I might need to look at the koala clip, too. Thank you for the great gift ideas! Try a rice sock instead of a heating pad. You take a large/long sock fill it up with white rice. Tie off at the top. Then at bedtime you pop it in the microwave for 2-3 mins to heat up the rice. Stick it in bed! I use it every night! It typically stays warm from 10pm-1/2am and I don’t wear socks to bed now! It’s also great to use on sore muscles. And some people drop a few drops of lavender essential oil to make it smell nice and lavender is supposed to be relaxing at bedtime. My husband, daughter and I each have our own sock with a different colored ribbon tied on it to tell them apart! Frozen junior mints are amazinggggggg. I have not run at all this week, as I am trying to kick this cold (flu?) and it is driving me crazy! Running at night is the only time I can run and after everything that’s happened lately, I get so nervous! I would love a device that makes noise versus just alerting my family members. Never tried frozen mints but that sounds like a great idea! Every runner should have a Run Angel! I am training for my first half and would love a Run Angel for my longer training runs! now this is on my wish list along with some punchy lip gloss! :) i think i am the most paranoid runner ever! I’ve been wanting one of these for a long time! I’ve been wanting one of these for a long time! I hope to get one some day. Also I want new socks! Love your blog! A Run Angel would be awesome. I recently moved from the city to the suburbs and am having such a hard time feeling safe when there’s no one around. When I was in the city there were always at least a few people in view, even pre-dawn. I’ve been wanting a Run Angel for solo long runs in my rural area. It’s on my list! I would really love a Run Angel!! I love the colors of your new running shoes! 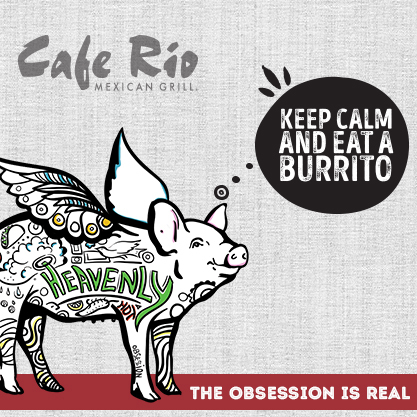 I never have used a run angel before, but I would love to try it :) Have a great weekend! Since my next marathon is going to be on the trails I have been hitting up the local trails and need something like run Angel to keep me safe! I would love the runangel! More for animals than people, though. My higher mileage runs are almost all on country roads. Love learning about new gear through your blog! I had no idea Brooks made a trail running shoe (in hindsight, why wouldn’t they?! LOL). There’s a trail run I sign up for every year in Silverton, Oregon through Silver Falls State Park with over a dozen waterfalls. There’s a 15 miler and a 7 miler. I’ve only signed up for the 7… someday maybe the 15. The run is in rainy November and the trails are just gross. But it is a challenge and sooo beautiful. With my badass girlfriends, it is a fun time. I’ve never heard of Run Angel before! The safety features are awesome! I run with mace strapped to my belt as well as with my Siberian Husky, hoping he looks fierce enough to deter attackers (but really he’s a friendly-woos). Happy Friday! Frozen almost any sort of chocolate (snickers and rolls) tends to be a good choice! My runs happen at 4:30 AM in the dark before my kids wake up, so a run angel would be perfect for me. Tomorrow is my birthday, so I’m feeling the luck on this one! So you asked for skin care recommendations forever ago, but I didn’t share then. The Jan Marini glycolic face wash plus a good moisturizer is a GAME CHANGER. You used to have to buy it from an esthetician but now it’s on Amazon! I have struggled with acne since I was 12 but a couple of months with this and my skin has never looked this good and even. Ever. And now I’ll hop off my soap box and cross my fingers for a Run Angel while I’m at it. I really should already have one living and running in Philly. Would love to win the Run Angel! Been looking for something to help keep me safe out on my solo runs. Hi!! Gosh I would LOVE A RUn ANGEL! I just moved the o a new place and my runs are now on heavily wooded trails! I have really wanted one of These but unfortunately a little out of my budget. Fingers crossed! Your posts always make me smile! I’m in the middle of a divorce and you help me remember that life will get better. I’m a long-time reader and always inspired by your perseverance and the smiles and stories you share. Thanks! I have been feeling the need for a run angel! I have been running faster due to a bit of anxiety while running, might negatively impact my splits! Would love to win a run angel as I do all of my runs alone early in the morning! Sarah Marie Designs has great merchandise! I would love to have a run angel. I currently live in Japan, where I can run anytime of the day without worrying about my safety. However, we will be moving back to a big city in the US next summer, and I would love the added security. I want a run angel for my marathon training in 2019!! I would feel so much safer running alone if I had a run Angel! Would love to have a run angel! I’m constantly having to run solo. I’m intrigued by the Sambucol. Thanks for the tip. I plan to pick up a box. Have a great weekend and a Merry Christmas! 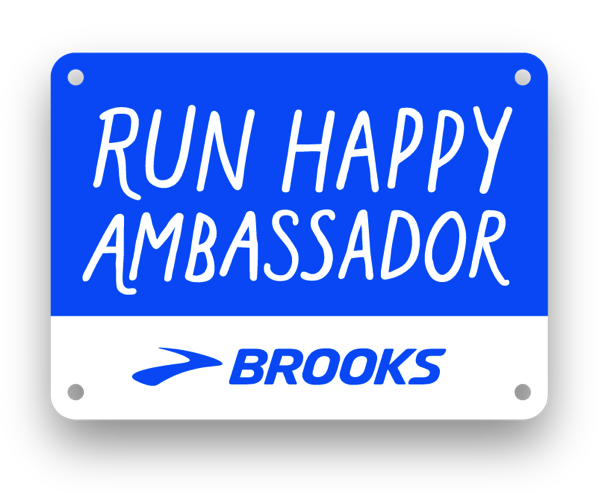 Hi…Thank you to Run Angel & Hungry Runner Girl for this generous offer. I had never heard of the Run Angel. Wow…what a great concept. The Inventor is a genius! I run every morning on MLK Blvd in Portland, Oregon after my 5:30 am Bootcamp. It’s still dark out that time of the morning and I don’t feel very safe. 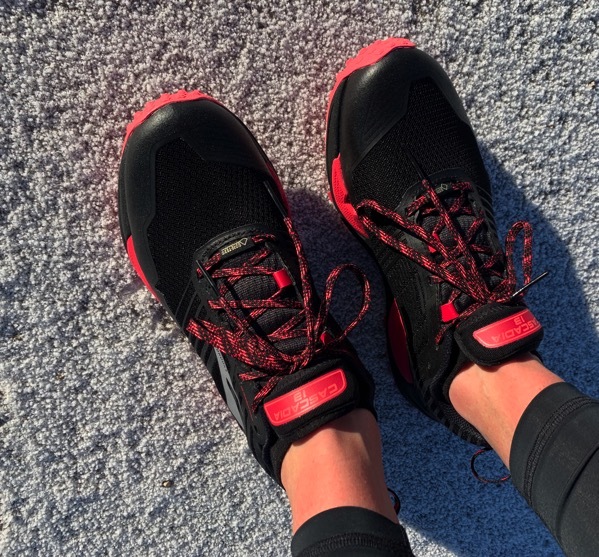 After reading your review of the Run Angel, I know this would make me feel better mentally and when I feel better mentally…I feel better physically, and when I feel better physically, I run faster…and when I run faster…I get to work on time :). Seriously…thank you for your generosity. So glad today is Friday, I thought it was never going to get here lol. Mint flavored things (with chocolate of course) is life!! Thanks for your updates!! I would love to win this! Running outside in the dark makes me too nervous so I’ve been spending a lot more time on my treadmill lately. Maybe this would help ease my anxiety!! I went running in the park last night after work…turns out there aren’t any lights there. I was carrying my phone as a flashlight in one hand and pepper spray in the other! And thinking constantly about whether something bad would happen to me or not…eek! Christmas time is the best 🥰 Yaktrax take some getting use to but i think they feel funny too!! Oh I would love a run angel!! Thanks for doing the giveaway! Merry Christmas to you and your cute family! I didn’t read the other comments so maybe someone already suggested but you need to get a heated mattress pad! My husband got me one shortly after we got married four years ago and it remains one of the best gifts he’s given me! Ours has two controls so I can put my side on full blast and he can set his lower. He turns it on when he gets home from work and by the time we go to bed it’s so warm. I usually turn it off when I get in but it solves that cold sheet first world problem for me. Merry Christmas! Run Angel seems like such a good idea! I’d love one. Also in the market for some new headphones…I’m still debating between the Apple Air pods and the Aftershox headphones though! I am a heating pad fanatic! Always bring one when I travel and I have a heated mattress pad at home but I’m sure if I were single that probably wouldn’t fly. Brilliant idea with the Andes mints in fact I do that with a lot of stuff…. Thanks for your blog. Love reading it every day. The Run Angel has been on my wish list since you first mentioned it on the blog, but I have yet to get one. I love when you tell us where you get things or what some of your favorite items are. I’ve gotten at least one or two pieces of clothing out of it! The run angel would be great since I run at 4:45 in the morning! Merry Christmas to you and your sweet family! I would love a run angel to keep me safe during my 5am runs!! I think Run Angel is a really cool idea! I’d love to have one for when I go out in the dark on the trails at night (they’re in town). But you know what else I really want? To hit some running goals. That’s all I can think about right now! The frozen mints are a good idea…but I’m much more into gingerbread than peppermint this year. Gingerbread pancakes, gingerbread protein powder mmm….I need to steer clear of seasonal items at TJ’s haha. Also, would love a Run Angel! Love the idea of a Run Angel! Here’s to running outside on those sunny winter days after being on the treadmill for too many days in a row! I was just looking at these. They look great, especially since I run on my own a lot. Thanks! Andes mints are the best! Especially the seasonal Christmas flavor!! I made peppermint bark today! I would love a runangel! I used to do all my weekday runs at home on a treadmill but we moved and I’ve been doing them outside (in the dark) and it would be great to feel a bit safer when I’m out in the dark by myself! Also.. I made the hot chocolate cookies you mentioned. So good! And I passed the recipe along to a friend and she loved them as well!! Running keeps me sane. It is “me” time that I love to do every day . It helps me be a better mom and wife. I had a scary/bad experience running outside this past summer that I have been sticking to my treadmill. Runangel would be a blessing to help me feel a bit safer during outside runs. 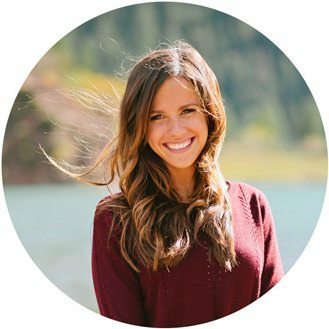 After a difficult year, my niece has taken up running and it has been life-changing for her. I would give the Run Angel because I worry about her running on trails alone. Janae, HappyHolidays to you and your beautiful family! thank you for being my favorite way to start my day. 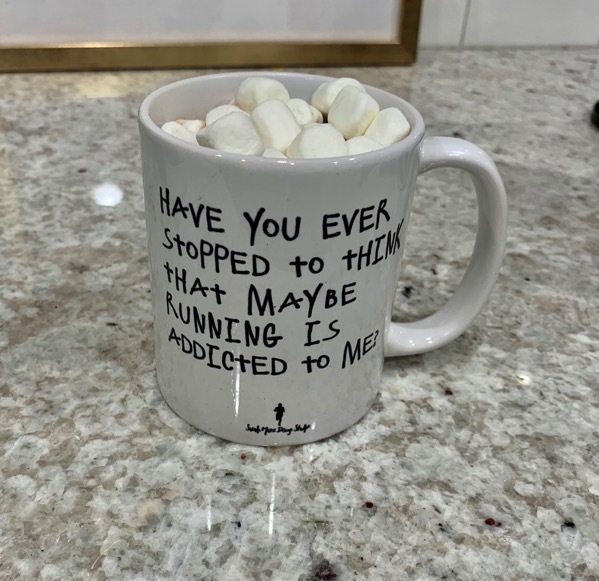 Your blog and my cup of coffee gets me out the door and for a run with motivation and lots of good podcast ideas! I do the same thing to my sheets in winter! I don’t necessarily need them super warm, but it’s nice to get the chill out. I’m also right there with you on Sambucol. I would love to have a run angel as I run out in the trails here in Delaware. Run Angel is such a great idea for us runners! I have to run tonight and I always worry a bit about my safety. Happy Holidays Janae! I always joke that I am scared of my own shadow! This would give me so much peace of mind during my runs. I love frozen York Peppermint Patties! Have you ever tried flannel sheets for the winter? They are nice and cozy warm without a heater!! I would love a runangel. 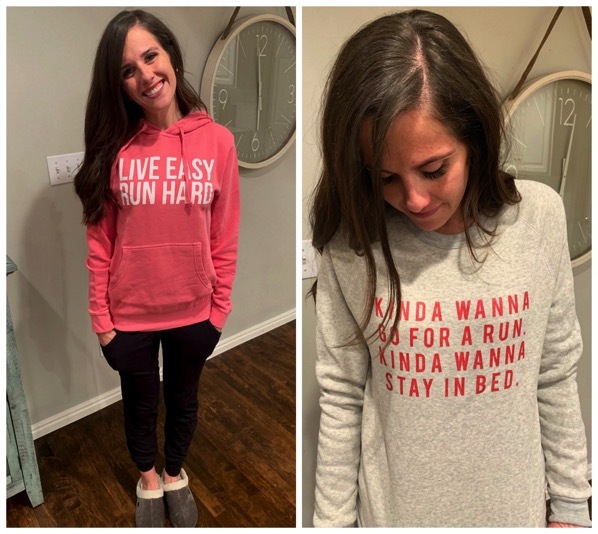 I need the kina want to run/kinda want to stay in bed sweatshirt! I would love a run angel when I get back to running hopefully in a couple of weeks. Extra safety is always good! I’m home from vacation visiting family in Washington! It’s so good to be home and I don’t miss the run from Washington! Happy to be back in the sunny desert! Try frozen York peppermint patties. So good!! Run angel for the win!! I don’t run outside on my own because I’m scared of something bad happening to me. I would love to get a RUN ANGEL to feel safe and run outside on my own. After two hip surgeries, I am finally getting back to running again this spring. The run angel would give my hubs some peace of mind once I start getting back to my early morning runs!! I think I may need to buy that book Skye got – my two year old’s name is Max. :) Plus who doesn’t love Christmas books?! Thank you for the tip on that planner – I am going to check it out here because I am in the market for a different type of planner this year… And I am also going to check out the Run Angel product too – I’ll be running more by myself/in the dark/on the trails – meaning I need some sort of safety device! My boyfriend and I both follow the same run plans but we are long distance. He would love me to be just a little safer on my runs. I wait around all year for the chocolate candy cane ice cream to come back! Love the chocolate and mint. I heard about Run Angel on a podcast before and have always wanted one. Other safety tools seem like they could be dangerous if another person got ahold of them. It would make me feel a lot more confident while running at certain times and spots. I think I missed the Run Angel giveaway but commenting just in case :). I think I need to bite the bullet and just buy one. I walk my dog late at night by myself a lot and sometimes get a little freaked. Although I know he’d protect me if need be, I’d rather not get in a situation where that was necessary. Oh my, your ankles look so cold! I’m a FL girl and I think I’d have to stick to the treadmill all winter! 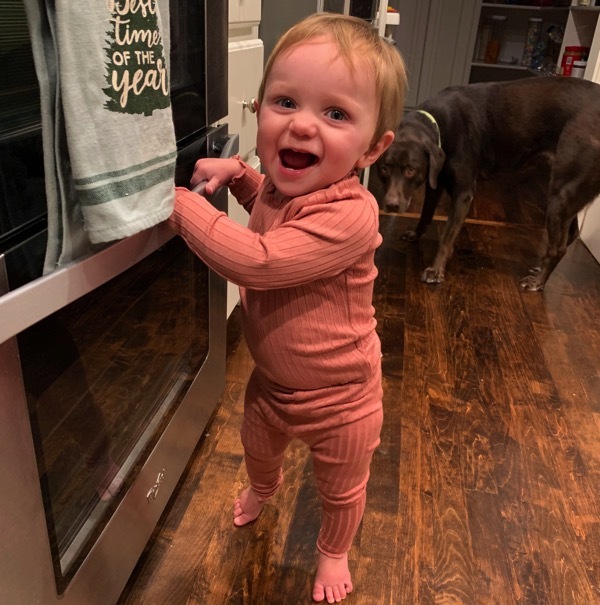 Love those PJs (and that I can get them on Amazon Prime. Yay!) do they run true to size?